How to narrow your training focus to be the best runner you can be at every age. Earlier this year, 15-year-old Katelyn Tuohy of Thiells, N.Y., ran a 5K in 15:37—the fastest time ever by an American girl of that age. If Tuohy continues to improve, she may one day have a shot at breaking the 5K American record of 14:38 (set by Shannon Rowbury when she was 32). And if she’s still competing at age 55, Tuohy could even surpass the fastest time ever run by an American of that age—Shirley Matson’s mark of 18:43, set way back in 1996. But to do these things, Tuohy will need to adjust how she trains in ways that exploit the strengths and limitations of an ever-changing body. Indeed, this is something all runners need to do. The best way for a 19-year-old beginner to train is not the best way for a seasoned 49-year-old to train (or a 49-year-old beginner, for that matter). Let’s take a look at how to train to be the best runner you can be at any age. This doesn’t mean you can’t train and race hard as an adolescent runner. Just don’t do it year-round, focus on having fun and enjoy other sports and fitness activities. Being well-rounded as an athlete in your teens will make you a better runner in your 20s and beyond. In the 20s the human body is at its physical peak. Although growth is complete, anabolic (i.e., tissue-building) hormone levels remain high, enabling runners in this age range to train hard and recover quickly. Take advantage of this opportunity by gradually increasing your running workload until you reach a limit that you’re comfortable with. A sensible approach is to increase your average weekly mileage by five miles every six months. About 25 percent of those miles should be run at race speeds, the rest nice and slow. After age 30, aerobic capacity—or the body’s ability to use oxygen to burn muscle fuels—begins to decline. Yet many runners continue to improve in their 30s. Why? Because runners who train smart at this age become more and more efficient, so their bodies require less oxygen to maintain a given pace. Efficiency results from the brain finding more economical ways to activate the muscles. You can’t control this process consciously, but you can accelerate it by including a lot of diversity in your training. Make “variation” your watchword as a 30-something runner, mixing up the surfaces you run on (pavement, grass, dirt, tracks), topography (flat, rolling, hilly) and speeds. Around age 40, women begin to lose strength, mainly due to decreasing muscle mass. This decline is slow initially, but it accelerates over time, and in runners it has a negative effect on both performance and injury risk. To combat this natural aging process, make strength training a priority in your 40s. A little strength training goes a long way—a 2012 study by researchers at the University of Memphis found that lifting weights twice a week was as effective as lifting weights three times a week in older women and men. The average age of menopause is 51. Caused by a decline in the body’s production of the hormone estrogen, this unavoidable “change of life” can be particularly challenging for runners. Common symptoms include insomnia, which can wreak havoc on post-run recovery, and hot flashes, which may cause you to feel uncomfortably warm when running. Other consequences of menopause that are unfriendly to running are increased body-fat storage and weaker bones. Running strong in your 50s demands a flexible, adaptive approach to training. Don’t try to force your changing body to do the same things it did in the past. Consider inserting an extra day of easy running between harder runs, and also slightly reducing the speed of your sprints and high-intensity intervals. Schedule in pencil, replacing challenging workouts with easier ones when you’re underslept or overheated and taking advantage of days when you feel good by doing a harder run. One of the more insidious aspects of aging for runners is a natural stiffening of connective tissues (ligaments, tendons and fascia) that occurs over time. By age 60, this process reaches a point in most runners where running is less comfortable and efficient and more likely to cause injuries such as Achilles tendinopathy. To fight back, make mobility exercises a regular part of your exercise routine. Mobility exercises are essentially moving stretches that restore the ability of your joints to move smoothly through a full range of motion. An example is the giant walking lunge, where you walk forward by taking the largest steps you can and bending the knee of the forward leg until the thigh is parallel to the floor—a great way to open up the hips. As a medical term, “frailty” refers to a common geriatric condition characterized by sarcopenia (loss of muscle mass and strength) and osteoporosis (weakened bones). According to a 2015 review by Belgian researchers, more than 1 in 20 people between the ages of 70 and 74 are frail, and nearly 1 in 10 between the ages of 75 and 79 suffers from the condition. 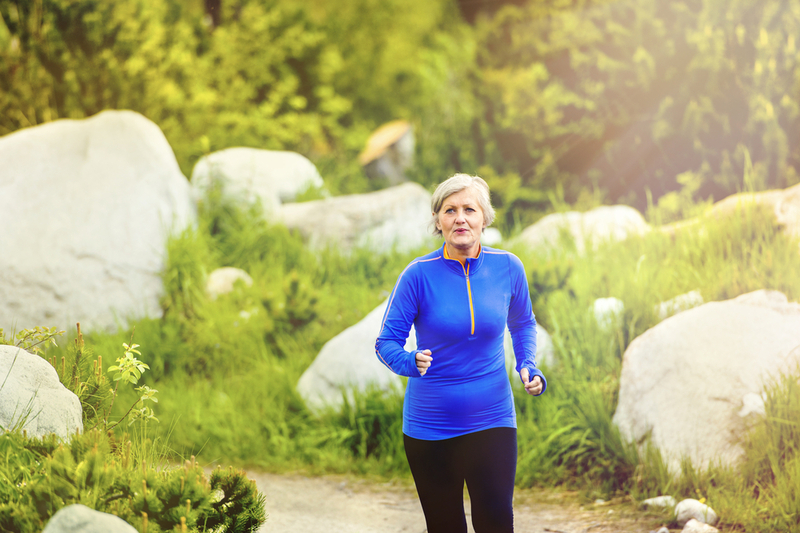 Other research suggests that running keeps aging muscles and bones from weakening, but it won’t stop the process completely, and as a high-impact activity, running can be hard on older bodies even when they’re not technically frail. If your goal is not only to stay healthy but to run strong and comfortably in your 70s, alternate your runs with workouts in a nonimpact cardio activity such as swimming or bicycling—and don’t neglect your strength workouts and mobility exercises!